2. To serve, put the crushed ice in a blender (work in batches if necessary). 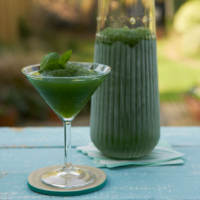 Add the chilled tequila mixture and basil leaves, then whizz until smooth, green and very thick – you may need to add more ice. Pour into martini glasses, garnish each with a basil sprig and serve immediately.